Turkey appears to be deepening its crackdown on journalists, putting one on trial the day after another was sentenced to prison. Mesale Tolu, whose trial began Wednesday, is charged with being a member of the Marxist-Leninist Communist Party -- which is labeled in her indictment as an "armed terror organization" -- and with spreading "terrorist propaganda," according to the indictment. She could face 15 years in prison if convicted. Tolu's trial began the day after authorities sentenced Wall Street Journal reporter Ayla Albayrak to two years in prison. Albayrak was tried and sentenced in absentia for spreading "terrorist propaganda" in her coverage of a Kurdish militant insurgency, according to the Journal. Albayrak is a dual Turkish-Finnish national and is currently in New York, where the Journal is based. Turkey has gutted local media organizations in its sweeping purge following an attempted military coup last year. But trials of foreign journalists, or reporters working for foreign media, is rare. 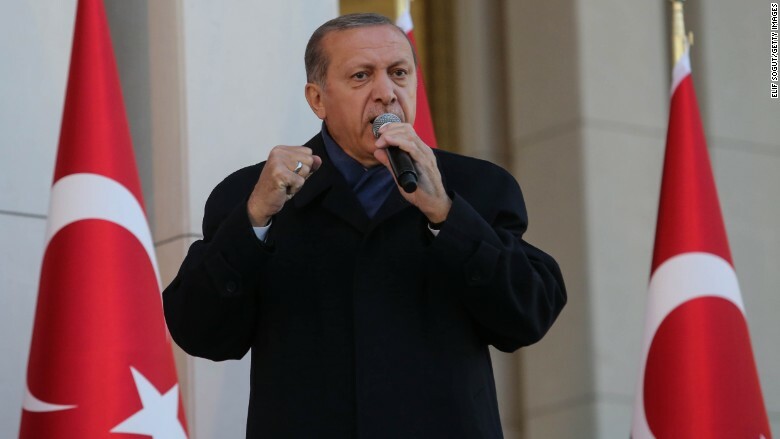 The trials also come at a time of rising tensions between Turkey and both Germany and the United States over the detention of several of their citizens. Eleven Germans are currently being held in Turkey for political reasons, the German Foreign Ministry has said. Chancellor Angela Merkel has described the arrests as "unjustified" and repeatedly called for the prisoners' release. Maria Adebahr, a German Foreign Ministry spokeswoman, said that the allegations against the Germans detained -- including Tolu, who is a German citizen -- were "absolutely unacceptable and are not correct." "It now depends on the court in Turkey to decide about Mrs. Tolu's trial. We hope this will be a fair trial," she said. While not commenting on specific cases, Turkish officials say charges against Turkish and foreign journalists are usually linked to their membership in "terrorist organizations" or their creation of "propaganda" on their behalf. Tolu worked as a reporter and translator for the Turkish ETHA news agency. Among the pieces of evidence used against her were her alleged attendance of funerals and memorial services for members of the Marxist-Leninist Communist Party who died in Syria. She has been imprisoned since her arrest on April 30 and has her toddler son with her in prison. Her son's father has also been detained. At least 81 journalists are behind bars in Turkey, according to the Committee to Protect Journalists. "We urge Turkey to respect and ensure freedom of expression, fair trial guarantees, judicial independence, and other human rights and fundamental freedoms, consistent with the Turkish Constitution. "Freedom of expression, including for speech and the media—even speech which some find controversial or uncomfortable—strengthens democracy and needs to be protected. More voices, not fewer, are necessary in challenging times." -- CNN's Judith Vonberg and Hadas Gold contributed reporting.